The widening engagement gap between borrowers and lenders is a cause of concern in the Mortgage Industry. Borrowers with access to the most sophisticated technologies expect a personalized, one-touch, technology driven, streamlined and simple mortgage experience. Lenders with strict regulatory compliance, low rates, complex process and reluctance in adopting newer technology are a long way from meeting those expectations. 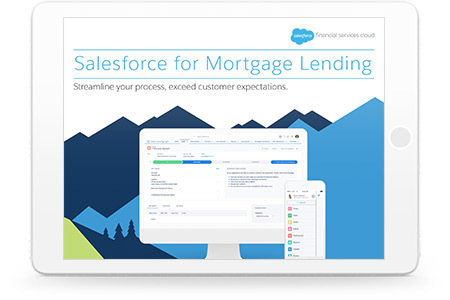 Lenders with the help of Salesforce can create a stronger and more effortless type of engagement and experience around the Mortgage process. Salesforce has evolved from a basic CRM system for sales process and management and is finding applications in compliance, workflows, marketing, lender management etc. Importance of Salesforce in Mortgage Banking Industry as a powerful solution transforming the engagement can been seen in the following aspects. Salesforce provides new ways to engage borrowers as well as getting them through the application process. The information regarding recent rates and refinancing thresholds can be right at the finger tips. The ability to schedule follow-ups and updating the pipeline is seamlessly integrated into the mobile version as well. Salesforce when integrated with LOS gives the ability to manage Loan servicing request like rate change and refinance in an efficient and flexible manner. Saleforce’s strong collaboration with real estate agents and brokers provides the opportunity for the lenders to develop those relations though referrals and loan processing collaboration. Uptakes of these relationships are newer and better opportunities to serve the borrowers. brings borrowers and lenders on the same platform. Borrowers can access loan information, track status of documentation requests and upload necessary documents. Online and mobile channel of the customer portal serves as a knowledge base and assistance provider for specific queries. providing accurate insights into the information about leads, prospects, applications, loan pipelines and closed loans. A bidirectional channel can push the data into the LOS and back into the Salesforce to drive the dashboards, workflows and notifications. User friendly and engaging web portals can be integrated into the Salesforce to streamline the entire process of lead generation. Marketing campaigns can be successfully run where web portals integrated with Salesforce can collect information and feedback from customers, nurture the leads and create as many touch points as possible. This internal collaboration can provide a 360 degree view of the customer. Salesforce is a comprehensive platform which helping lenders to adapt faster, act smarter, and differentiate themselves in a rapidly evolving marketplace. Salesforce Marketing Cloud, Salesforce Community Cloud, Salesforce Financial Services Cloud and Saleforce Einstein and Salesforce Platform are the different products which are typically fit for the Mortgage Industry.